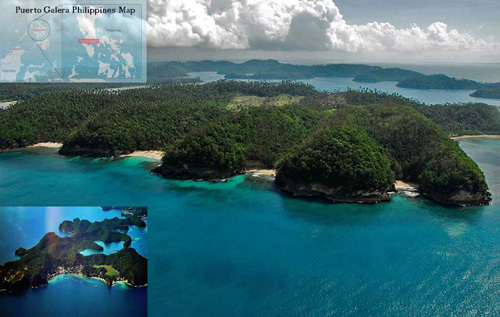 Three of CNN's 100 Best Beaches in the World of 2013 are in the Philippines. International publications like New York Times and Travel+Leisure Magazine named the Philippines among the hottest tourism destinations. The Philippines is almost the same size as the State of Arizona (roughly 116,000 square miles or 300,000 square kilometers), but it is one of the Top 5 countries with the longest coastlines in the world. 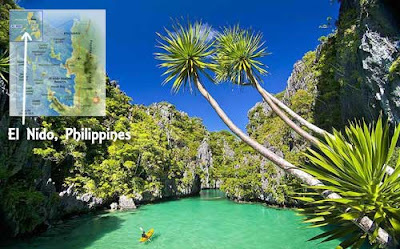 With its 7000+ islands, the Philippines is indeed blessed with so many gorgeous beaches. 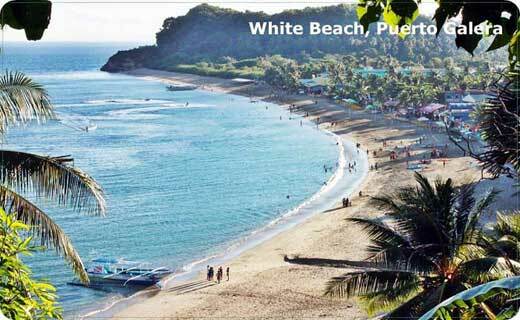 Puerto Galera is the northwesternmost municipality in the province of Oriental Mindoro, Philippines. 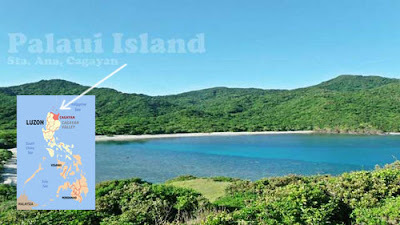 It is located at the southwestern end of the Isla Verde Passage, about 130 kilometers (81 mi) south of Manila. This coastal town is well known among tourists for its numerous pocket beaches and many snorkeling and Scuba diving spots. The area was designated a Man and Biosphere Reserve of UNESCO and has some of the most diverse coral reef diving in Asia. 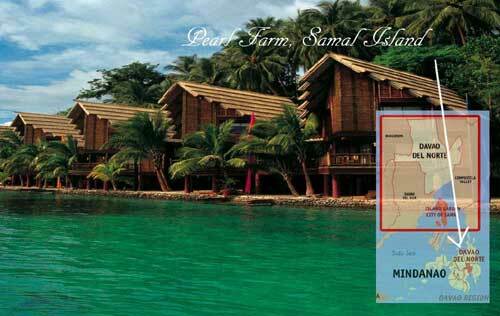 Siargao is a tear-drop shaped island in the Philippine Sea situated 800 kilometers southeast of Manila in the province of Surigao del Norte. 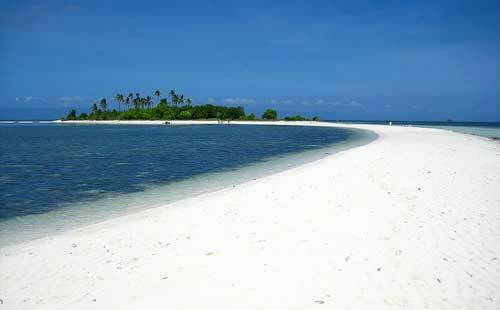 Siargao's coastline is marked by a succession of reefs, small points and white, sandy beaches. One of the best known surfing waves on Siargao and the Philippines, with a worldwide reputation for thick, hollow tubes is "Cloud 9". 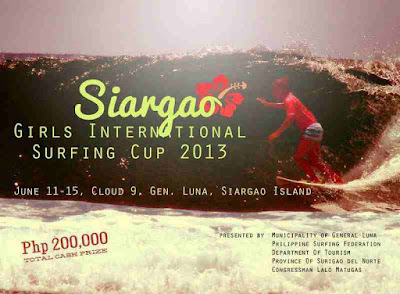 This right-breaking reef wave is the site of the annual Siargao Cup, a domestic and international surfing competition sponsored by the provincial government of Surigao del Norte. 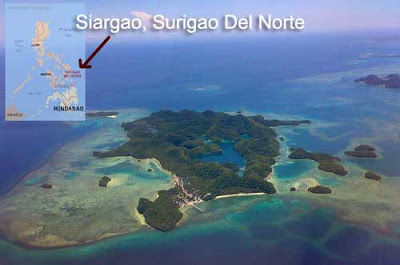 Siargao Island also contains the largest mangrove forest reserves in Mindanao, at Del Carmen. Pagudpud is a fourth class municipality and a coastal resort town of Ilocos Norte province, in the northern Ilocos Region of the Philippines. 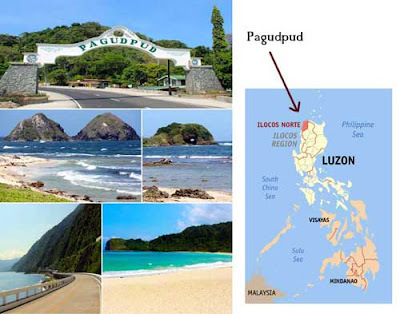 Pagudpud rolls over mountains, hills, valleys and flat coastal land. 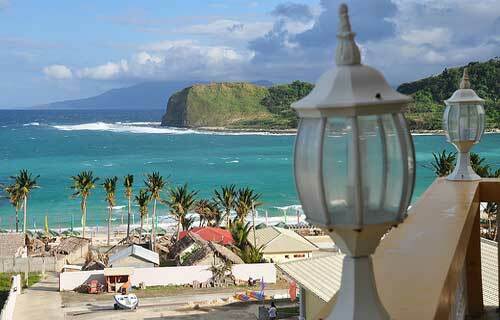 Its white-sand beaches and crystal-blue water makes Pagudpud a haven for tourists. Maira-Ira Point is also an emerging attraction with its secluded beach known as the Blue Lagoon, as well as kilometer-long Saud Beach. On a clear day, the Babuyan Islands ( northernmost group of islands in the Philippines) are visible from Patapat National Park in Pagudpud. The Patapat Viaduct, 16 kilometers ( 9 mi.) from Pagudpud town proper, offers a scenic view of Pasaleng Bay- a view that leads towards wide and pristine beaches backed by mountains and thick forest, with breathtaking waterfalls Kabigan and Mabaga, along with the many cool, refreshing springs. 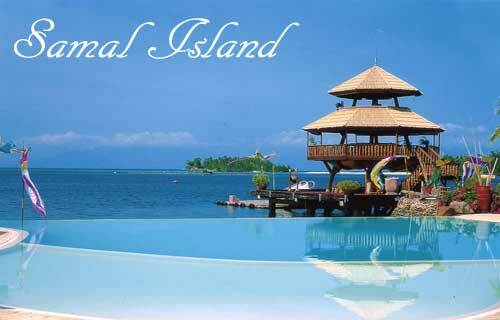 Panglao is an island in the Philippines located in the Central Visayas. 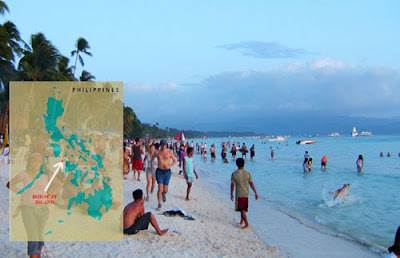 Panglao is located southwest of the island of Bohol and east of Cebu. It is a popular tourist destination in the Philippines and includes several small islands like Gak-ang, Pontod, and Balicasag. Alona Beach in Panglao is sometimes compared to Boracay because of its a amazing white beach and crystal clear water. Panglao has a terrain that range from plain, hilly to mountainous. Panglao alone has more marine biodiversity than Japan and the Mediterranean sea About 250 new species of crustaceans and 2500 new species of mollusks were found around the island. Panglao Island is one the main tourist destinations on the Philippines. 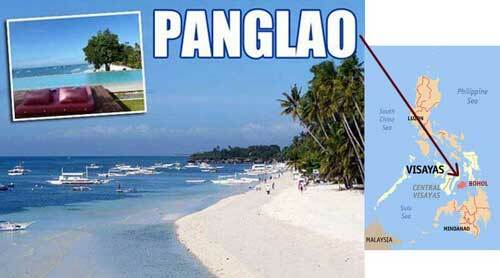 Panglao is made of Maribojoc Limestone, the youngest of the limestone units found in the western area of Bohol. This coralline limestone is soluble which causes formation of caves and sinkholes. One interesting geological feature found in the island is the Hinagdanan Cave which has an underground water source. The cave is an important water source as the island has no rivers or lakes. Palaui Island was declared as a National Marine Reserve in August 28, 1994 encompassing an area of 7,145 hectares (17,660 acres). The waters around the island boast of 21 commercial species of fishes with about 50 hectares (120 acres) of undisturbed corals. In 2013, Palaui was used as the filming location for the famous TV show Survivor: Blood vs. Water and Survivor: Cagayan. 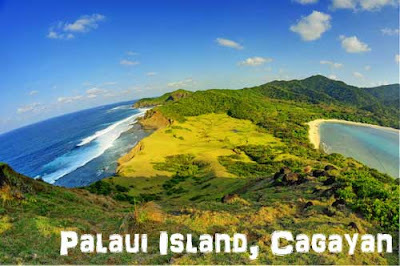 On May 2013, Palaui Island earned the 10th spot in the CNN's World's 100 Best Beaches list - “Glorious white sands meet volcanic rocks and blue-green waters topside, while coral gardens and a rich marine reserve meet divers under the surface. Palaui is all about raw beauty" - CNN. Boracay is a small island in the Philippines located approximately 315 km (196 mi) south of Manila. 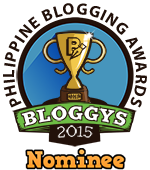 Boracay Island and its beaches have received awards from numerous travel publications and agencies. Apart from its white sand beaches, Boracay is also famous for being one of the world's top destinations for relaxation and nightlife. 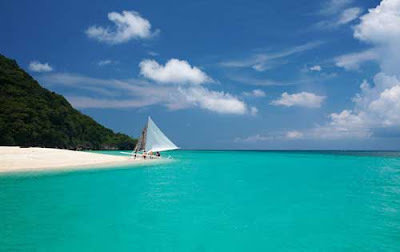 In 2012, Boracay was awarded as the best island in the world from the international travel magazine Travel + Leisure. In 2013, one of the less busy beaches in Boracay ( Puka Beach ) earned the 84th spot in the CNN's World's 100 Best Beach List - "Making a respectable claim to its ‘tropical paradise’ reputation, Boracay has powdery beaches, water sports and spas. Puka is the second-longest beach on Boracay and relatively empty most times, with no resorts and a limited number of restaurants” CNN said. Earning the 14th spot in the CNN's Best Beaches in the World List, El Nido is more than just a stereotypical tropical paradise. Beaches, clear waters, underwater caves, jungle, steep limestone cliffs and stunning inlets make for one of the world's most beautiful seascapes. 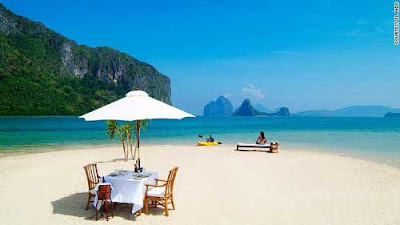 El Nido is a coastal settlement on the Philippines island of Palawan. It is comprised of 45 islands and islets; limestone cliffs, which form a Karst backdrop similar to those found in Ha Long Bay, Krabi and Guilin are also found in El Nido.